Above, a full page ad in the Buffalo city directory for 1885. And see the Globe Soap Trade Card in the prior post. Gies & Co. was started by Charles Gies, who was born April 1846 in the Alsace-Lorraine region of France (place of birth per the 1920 census), though the region was not named as such until later. He emigrated to the United States in 1854 at age eight with his parents and siblings, on board the ship Brother Jonathan. Starting up the company, along with Gies, was New York native George H. Dunston. 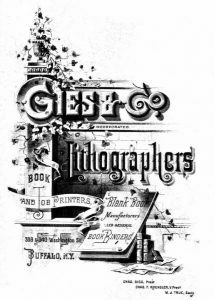 Gies & Co. became a major player in the printing/lithography/engraving field, and numerous examples of their work can be found online and elsewhere. The company continued in business until about 1922. Dunston, at some point, went out on his own, though may have still been involved in Gies & Co. for a time, and as this would be a subject for some lengthy research, we’ll stick to Charles Gies for this post. Charles married New York native Frances “Fannie” Boughton in August of 1869 (per the 1870 census). They had three daughters Lillian “Lillie”, Frances “Fannie” and Sarah Elizabeth “Sallie”. Charles’ sister Margaret “Maggie” lived with the family for a time, from at least 1875 – 1880. Sadly, Lillie died at about age 17, and Sallie in infancy. And Charles’ father Valentine Gies, having moved his family from Alsace to New York, died in the Civil War, about 11 years after emigrating. Prior to starting the company, from at least 1864 – 1869, Charles Gies was with Sage, Sons & Co., lithographers, Buffalo. Per a September 1878 article appearing in The Buffalo Commercial, Gies & Co., established almost four years earlier, is Messrs. Charles Gies and George H. Dunston. The following day after a major fire (the article does not state when) had devastated their location at Washington and S. Division, they rented a large 3-story brick building at 293 Washington to be able to continue filling orders, operating from 6:30 a.m. till 10 p.m., until the original building was repaired. They were back at the original site, which included many improvements, in mid-September 1875, employing about 45 workers at that time. The clipping, below, part of an article that appeared in The Buffalo Commercial, January 31, 1891, gives us a good glimpse into the lithography business. 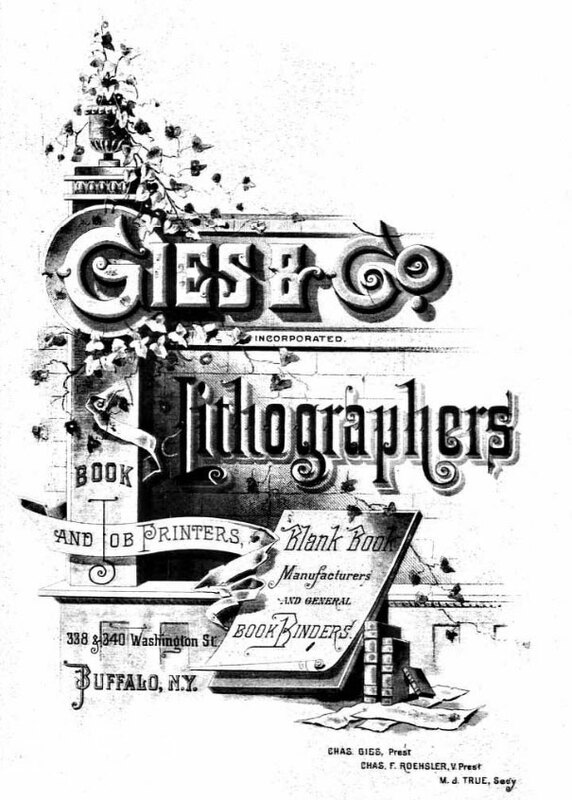 It lists Gies & Co. as one of five major firms in Buffalo, and details the problem lithographers were having at that time with what was thought to have been an oversight when drawn up, of a bill that was pending at the Senate. 1885 – Gies & Co. moves to a new facility which they have constructed, a 5-story brick building at the corner of Swan and Center Streets. 1905 – NY State Census for Buffalo, Charles Gies, with wife Frances. Charles’ occupation is city inspector. 1914 – death of Fannie (Boughton) Gies, January 4th, Manhattan, NY. 1920 – Charles Gies, widower, retired lithographer, boarding at 317 Breckenridge St.
Year: 1854; Arrival: New York, New York; Microfilm Serial: M237, 1820-1897; Microfilm Roll: Roll 140; Line: 19; List Number: 650. (Ancestry.com). The National Archives at Washington, D.C.; Washington, D.C.; NAI Title: General Index to Civil War and Later Pension Files, ca. 1949 – ca. 1949; NAI Number: 563268; Record Group Title: Records of the Department of Veterans Affairs, 1773 – 2007; Record Group Number: 15; Series Title: U.S., Civil War Pension Index: General Index to Pension Files, 1861-1934; Series Number: T288; Roll: 174. (Ancestry.com). Census of the state of New York, for 1875. Microfilm. New York State Archives, Albany, New York. (Ancestry.com). Thomas’s Buffalo City Directory, 1864. p. 195. Ancestry.com. U.S. City Directories, 1822-1995. Warren Johnson & Co.’s Buffalo City Directory, 1869. p. 306. Ancestry.com. U.S. City Directories, 1822-1995. Year: 1880; Census Place: Buffalo, Erie, New York; Roll: 831; Family History Film: 1254831; Page: 158A; Enumeration District: 163. (Ancestry.com). Fire and rebuilding. The Buffalo Commercial, September 14, 1878. Saturday, p. 3. (Newspapers.com). “A Serious Oversight.” The Buffalo Commercial, January 31, 1891. Saturday, p. 10. (Newspapers.com). New York State Archives; Albany, New York; State Population Census Schedules, 1905; Election District: E.D. 05; City: Buffalo Ward 24; County: Erie; Page: 61. (Ancestry.com). Year: 1920; Census Place: Buffalo Ward 22, Erie, New York; Roll: T625_1107; Page: 9B; Enumeration District: 209. (Ancestry.com). Find A Grave Memorial #s 143437158; 143437263; 143438043; 144124935. Findagrave.com.